The Nazi leader failed to heed the guidance of his closest military adviser. In Hitler’s goals to attain Germanic dominion of the planet, he enjoyed some of his most triumphant days secured away at the vast, virtually unheard of Wolf’s Lair. The complex was known in the German tongue as Wolfsschanze. Hitler had inserted “Wolf” into the title of many of his military headquarters, as it was a self-appointed nickname. Situated over 400 miles from Berlin in East Prussia, Hitler arrived at the Wolf’s Lair for the first occasion during late evening of 23 June 1941. The advanced time was not an issue. From the days of Hitler’s “struggle” beginning in the early 1920s, he had developed a habit of remaining active until the small hours, often present in rowdy beer halls, and rising as late as noon. On the night of 23 June 1941, the dictator was again in no mood for bed rest; his form was in fact jubilant as remarkable news filtered through from the Eastern Front. Less than 48 hours after the invasion began, German armies were smashing through the first bewildered Soviet lines, and had already reached the USSR republics of Lithuania, Belarus and the Ukraine. Field Marshal Wilhelm Keitel, Hitler’s most trusted military companion, also travelled eastwards to join his leader at the new Wolf’s Lair. As Operation Barbarossa rolled mercilessly along, Keitel’s disposition remained pensive and austere. It was the 58-year-old Keitel, almost standing alone in isolation, who had warned Hitler not to attack the Soviet Union. Conservative and cautious by nature, Keitel detected the unmistakable sense of danger in the air. He was convinced that assaulting a landmass as great as the USSR – with its numerous complications – would be a task too much, even for the apparently unstoppable Wehrmacht. Due to Keitel’s reputation as a willing pawn of Hitler, he was held in poor esteem by an array of German generals and field marshals. Yet Keitel’s military career had dated to the year 1901, and he possessed a distinguished record, claiming honours for bravery during the First World War while rising through the ranks. Keitel’s demeanour was that of a charming and approachable officer, educated in the old-fashioned virtues of the Prussian military establishment. Keitel possessed strong organizational and literary skills, but lacked the insubordinate, resolute nature to challenge Hitler directly. “It isn’t right to be obedient only when things go well; it is much harder to be a good, obedient soldier when things go badly and times are hard. Obedience and faith at such time is a virtue”. His subservience would inevitably lead to a complicity in some of the Nazis’ atrocious crimes. Unlike Keitel, the great majority of German military leaders firmly supported Hitler’s decision to attack Russia, believing the conflict would last around two months with Stalin’s expected ousting and death. The Nazi war chiefs’ unrealistic confidence swayed Hitler, who believed the Red Army would fold like a pack of cards. By mid-1941 Hitler had still to assume personal command of men in the field, and he unavoidably lacked the required knowledge and expertise. Meanwhile, on the same evening that Hitler first entered the Wolf’s Lair (23 June 1941), one of the largest tank engagements in military history was starting. It was called the Battle of Brody: A near forgotten clash in north-western Ukraine between 750 panzers and 3,500 Soviet tanks, stretching across the cities of Brody, Dubno and Lutsk. About 350 miles northwards Hitler was in tune to proceedings from the Wolf’s Lair, and awaiting further stunning reports. They would come. Despite the Nazis being outnumbered by more than four to one during the Battle of Brody, their panzers bludgeoned a way to victory by 30 June 1941. The Germans destroyed many hundreds of Soviet tanks, while meting out 65,000 casualties upon the Red Army. For mile after mile, this section of north-western Ukraine was strewn with dead bodies and horses, shattered Soviet armoured vehicles along with battered heavy weaponry. The triumph around Brody consolidated vital German gains on the Ukraine’s western boundaries. It was also an indication of the ferocity of Hitler’s troops, as they unleashed what would be the bloodiest invasion of all time. Also on the night Hitler became acquainted with the Wolf’s Lair, the Battle of Raseiniai was under way in western Lithuania; it was another critical early meeting between around 240 panzers and 750 Soviet tanks. Outmatched by three to one, the Germans were again victorious in the face of seemingly daunting odds. By 27 June 1941, they had destroyed over 700 of the Soviets’ 750 tanks near Raseiniai, a medieval Lithuanian town. The Luftwaffe also provided telling air support when it was needed. Further south Lithuania’s capital, Vilnius, had easily been captured on 24 June 1941 and Kaunas, the country’s second largest city, capitulated that day too. Germany’s Army Group North, under Field Marshal Ritter von Leeb, was now positioned 600 miles from Moscow; yet his key objective was to seize the major Russian city of Leningrad closer to the north. As a Blitzkrieg easily overcame Red Army resistance in Lithuania, an onlooking Hitler had been situated a mere 90 miles from the Lithuanian border at his Wolf’s Lair. In Hitler’s choice of headquarters across Europe, it was his desire to be as near the fighting as conceivably possible. Previously, as the Battle of France commenced (10 May–25 June 1940), Hitler’s compound, the Wolf’s Ravine (Wolfsschlucht), was erected in the Belgian village of Brûly-de-Pesche. While the Nazi leader oversaw France’s swift and humiliating defeat, he became a resident for over two weeks at this Belgian hamlet. Brûly-de-Pesche is only five miles from the French northern frontier, and Paris was within comfortable driving distance. Choice of location for the Wolf’s Lair was painstakingly assessed; in late 1940, construction began in the ancient and mysterious Masurian woods, near a small Prussian town called Rastenburg. The Wolf’s Lair was clear of urban centres and primary roads, while its entire complex covered 2.5 square miles. It was safeguarded by three security zones, and disguised by extensive netting that cleverly mimicked leaf cover when viewed from above. “I was ordered to the Wolfsschanze [Wolf’s Lair] nine times and also flew over it; it was so very well camouflaged from air attack that one could only see trees. The guarded access roads snaked through the forest, in such a way that I would have been unable to give the exact location of the Führer headquarters”. 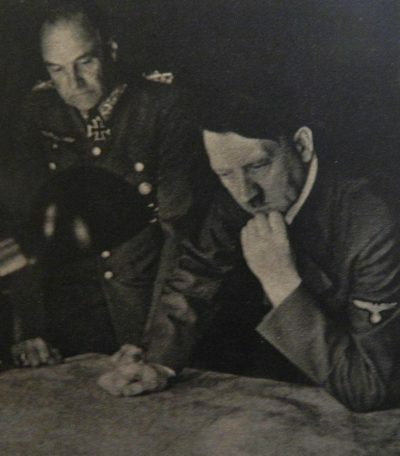 Regardless of Hitler’s growing fears and precautions, not one bomb was dropped on the Wolf’s Lair, while his private secretary Traudl Junge later revealed “there was never more than a single aircraft hovering over the forest”. This is despite the fact that Hitler spent over 800 days immersed there. As Germany’s victories mounted, the prevailing mood at the Wolf’s Lair became increasingly euphoric. At the end of June 1941, German forces had claimed a significant success when capturing Minsk, the sprawling capital of Belarus. By 11 July 1941, the Wehrmacht had conquered vast regions of Belarus, a state rivalling the size of Great Britain. In doing so, the Nazis inflicted almost 420,000 casualties on Soviet divisions around the Belarusian capital, while the invaders lost only 12,000 men by comparison. During fighting near Minsk, the Red Army further saw 4,800 of its tanks eliminated and up to 1,700 aircraft destroyed, while the Germans were shorn of just 100 panzers and 275 airplanes. The scale of victory is put into even sharper perspective when considering the Wehrmacht had a combined total of about 3,500 panzers, and little more than 2,000 warplanes. While July 1941 proceeded, German infantrymen were pouring forward onto the very borders of Russia, taking the town of Ostrov on 4 July, in north-west Russia – followed, on 8 July, by their capturing Pskov 30 miles further north. From the small city of Pskov, Moscow lay but 450 miles further east. As the world looked on in wonder, including the Americans and British, it seemed an eventuality the Nazis would cover these last few hundred miles, and overwhelm the Russian capital. By 10 July 1941, the 13th Panzer Division (of Army Group South) had advanced to the Irpin River, just over 10 miles from Kiev, the capital of the Ukraine – a country with a rich agricultural base that would help sustain Germany’s foot soldiers. Yet it would not be for another nine weeks until Kiev itself fell, with the surrendering of almost 700,000 Soviet troops. In the meantime, due to the incredible progression and devastation wrought, it was perhaps not surprising that on 8 July 1941 a boastful Hitler was telling propaganda minister Joseph Goebbels, “The war in the east was in the main already won”. Hitler was simply echoing the views of his commanders. “So it’s really not saying too much, if I claim that the campaign against Russia has been won in 14 days”. “We now need National Socialist ardour rather than professional ability to settle matters in the East. Obviously, I cannot expect this of you”. Hitler replaced Halder with General Kurt Zeitzler, who was thought to be a genius in his ability to manoeuvre large formations across battlefields, and perceive danger. It was expected that Zeitzler would finally move German armies to where Hitler wanted them to go.